Smith Memorial Hall was designed by architects, James M. White & George E. Wright. 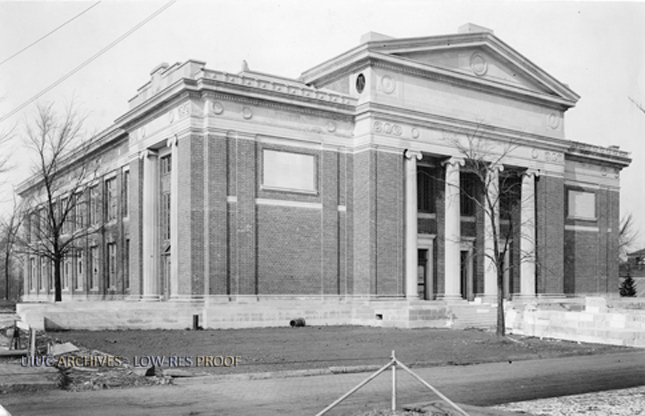 Located in Urbana, the beaux-arts style building was completed in 1920. Smith Memorial Hall was named for Tina Weedon Smith, wife of Captain Thomas J. Smith of Champaign, IL. 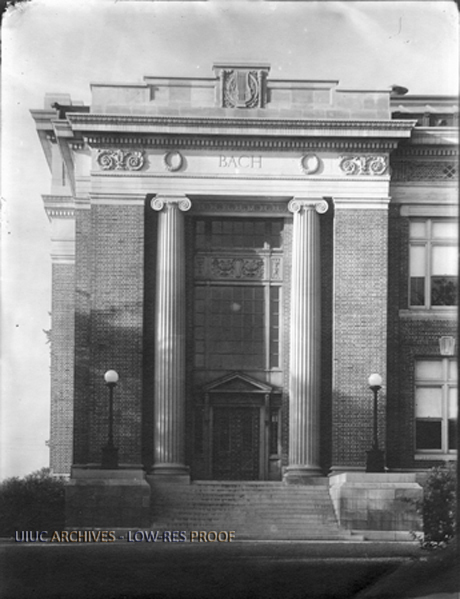 On August 14, 1913, Captain Thomas J. Smith wrote a letter to Captain Edward Bailey stating that Smith intended to donate about $200,000 to the University of Illinois to build a music building in memory of his wife. Captain Smith had been a member of the board of trustees from 1897 to 1903. Smith donated land and money that totaled approximately $480,500 to pay for the building construction. The building was dedicated to Tina Smith on April 27, 1922. The building exhibits the inscriptions of several well-known composers: Joseph Haydn, Johann Sebastian Bach, Ludwig van Beethoven, and Giovanni Palestrina. The decoration of the Recital Hall is greatly embellished with different musical instruments including cymbals, flutes, xylophones, horns and various string instruments. Smith Memorial Hall was meant for many different types of performances with various instruments to occur in many different rooms with multiple acoustic designs in every room. Smith Memorial Hall houses many different musical performance and practice rooms, the largest of which is the large performance hall, which seats 650 in the orchestra and 450 in the balcony. The acoustics of the large performance hall are controlled by having a period of reverberation of 1.75 seconds when at full capacity, and having provisions in the design to decrease the period of reverberation when the hall was empty. The building also has a number of practice rooms, including seven studios and two classrooms on the first floor, and an additional 11 studios and 49 practice rooms on the second floor. The second floor is also home to a 200-person lecture room. The third floor of the hall houses another additional 47 practice rooms. 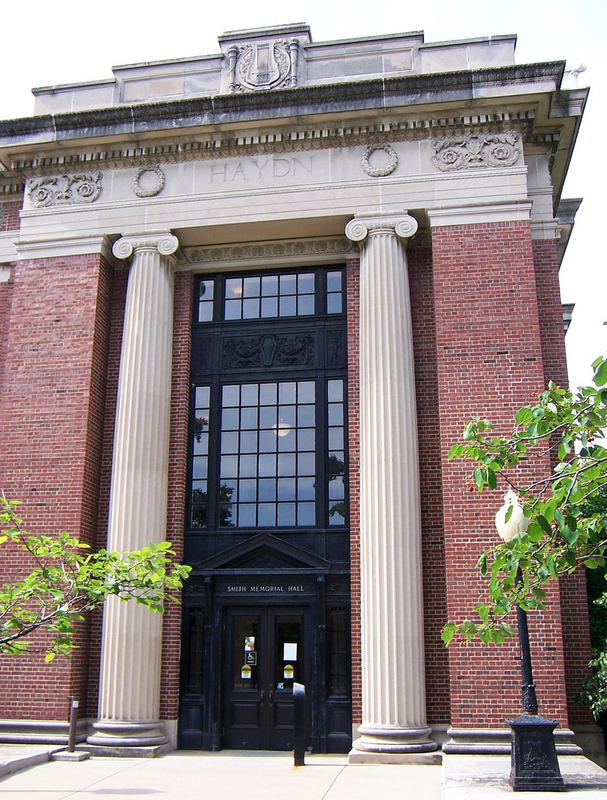 Smith Memorial Hall also boasts a 900-person recital room lined with detailed mahogany woodwork throughout. This recital hall is where the three manual Casavant Frères organ is located. The Memorial Room of the Smith Memorial Hall is a lavishly decorated drawing room, with crystal chandeliers. It is often used for chamber music performances and student recitals. Materials used during the construction were large amounts of stone, brick, metal, and limestone. The building was designed in the Beaux-Arts architecture. Smith Memorial Hall has many different musical performance and practice rooms. James M. White was a professor at the University of Illinois at Urbana-Champaign and also helped with many other projects that were done on campus. George E. Wright was only known for collaborating with James M. White on the design and construction of Smith Memorial Hall. 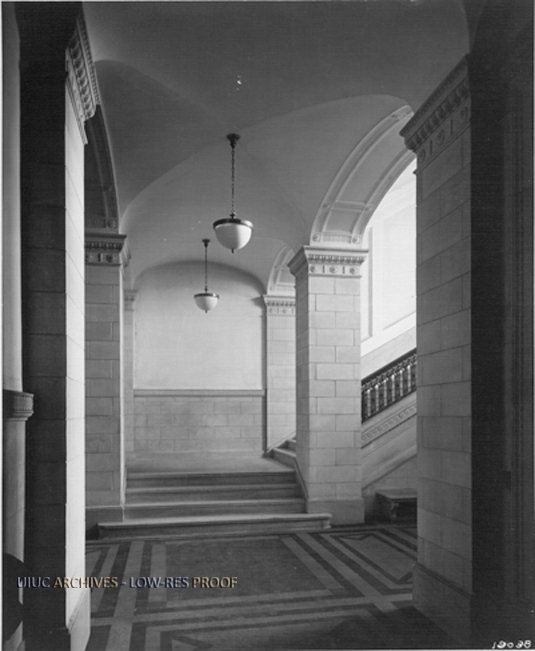 Interior of the entry hall: Image courtesy University of Illinois Archives. Please contact the University Archives if you can help to identify the copyright holder of this image. 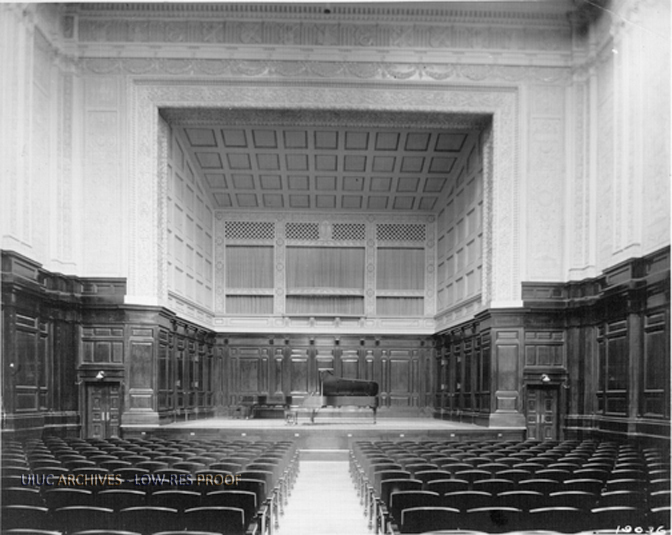 Recital hall and stage: Image courtesy University of Illinois Archives. Please contact the University Archives if you can help to identify the copyright holder of this image. 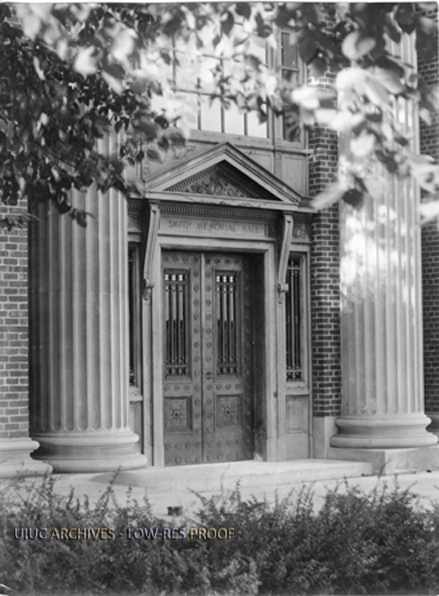 Side entrance displaying "Bach" engraving: Image courtesy University of Illinois Archives. Please contact the University Archives if you can help to identify the copyright holder of this image. 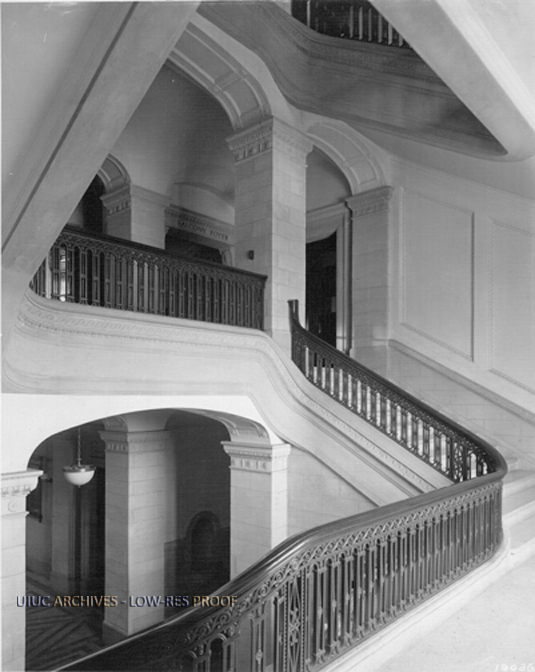 Main staircase: Image courtesy University of Illinois Archives. Please contact the University Archives if you can help to identify the copyright holder of this image. Closeup of entrance, ca. 1930: Image courtesy University of Illinois Archives. Please contact the University Archives if you can help to identify the copyright holder of this image. Smith Music Building, ca. 1921: Image courtesy University of Illinois Archives. 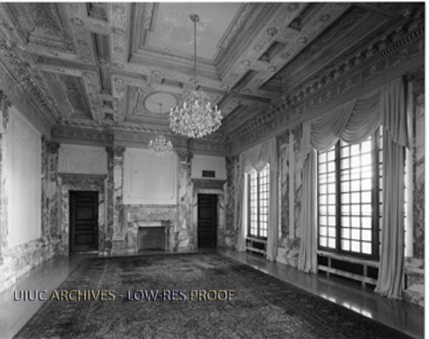 Memorial room looking east: Image courtesy University of Illinois Archives. Please contact the University Archives if you can help to identify the copyright holder of this image. Entrance displaying "Haydn" engraving: Image courtesy army.arch@flickr.com, all rights reserved. 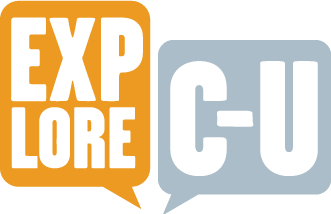 Francisco Aguayo, Adrianne M. Schmitz, and Roberta Solorio Arel, “Smith Memorial Hall,” ExploreCU, accessed April 20, 2019, https://explorecu.org/items/show/287.